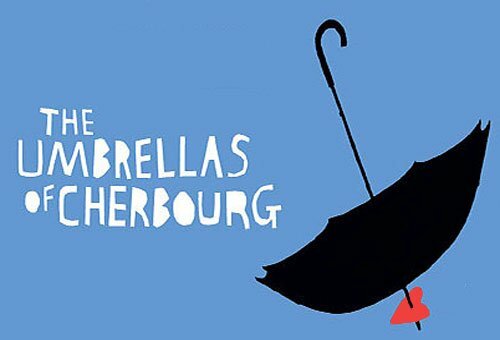 This evening I was very fortunate enough to be invited along to the trade night of The Umbrellas of Cherbourg – currently in previews at the West End’s Gielgud Theatre, and having it’s opening night on March 22nd 2011. It’s 1957 and we are in the French port of Cherbourg. Jazz, sailors and vin rouge dance deliciously in the air, and l’amour laps against the shores of the heart! Boy (young auto mechanic Guy Fouchier) loves girl (umbrella shop sales assistant Geneviève Emery). They whisper “je t’aime” with the certainty of youth, but when war comes between them, Geneviève has to choose between waiting for her homespun hero or plumping for the dashing diamond dealer asking for her hand… quel dilemme! Oh, and did we mention the baby that’s on its way? Zut alors! I have to confess that I knew not of the story of the show prior to my attendance this evening, other than the basic story line and teasers that I had seen online – I was (surprisingly!) previously oblivious to the musical film from 1964 of the same name. Therefore, it was with a completely open mind that I took my seat at the Gielgud this evening, and this ‘review’ solely focuses on the production without comparison. The main storyline driving this production is your classic boy meets girl, boy has to go away leaving pregnant girlfriend, girlfriend then encounters other temptations, and doesn’t really hide many surprises if I am honest. I will say outright that I immensely enjoyed this production, but, for me, the storyline was something that whilst not in any way unpleasant, I could take-or-leave, and I found that I just really enjoyed being swept along for the ride! The production values on this show are second-to-none with a fantastically gorgeous set and stage design, definitely my favourite of all of those in the West End at the moment, and with such wonderful choreography (especially with the use of the three sailors) that this entire production seems absolutely seamless. Full credit to Emma Rice and her direction/choreography. There is a fabulous atmosphere that is created in the theatre, and it’s so easy to get swept away into the wonderfully romantic setting of a small umbrella shop in the quaint and sleepy port town of Cherbourg, France – at times you really do forget you’re sat in the middle of Shaftesbury Avenue with a couple of thousand other people! 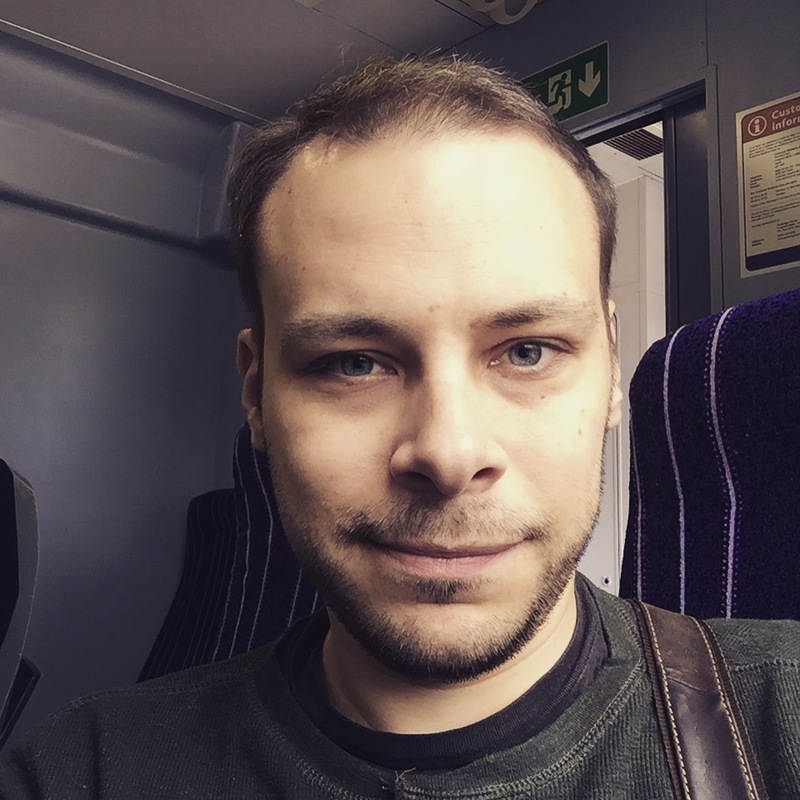 Personally, I was all but sold on ditching my flat in Vauxhall and buying a house in Cherbourg and soaking up the awesome ambience that the place seemed to have hehe! Class is definitely the name of the game here, and without exception, all elements of this production absolutely ooze it. The entire cast are a very strong bunch. It was great to see Joanna Riding back on a West End stage (I’ve been a big fan ever since Witches of Eastwick hit the Theatre Royal Drury Lane over a decade ago) and the highly billed ‘international cabaret sensation’ Meow Meow was a fantastic addition to the production (and is a character that I believe has been specially created for this production). Her version of the song ‘Sans Toi’ actually had me sniffling to myself in the back row – I LOVED IT!! Karl and I could definitely see ourselves spending a couple of hours just watching Meow Meow doing cabaret in the future, and I hope there’ll be some London dates somewhere so that we can see her outside of the show! The score is delightfully light and different to many other things currently in the West End. I loved that there was a harp, and a xylophone, and thanks to the lack of orchestra pit at the Gielgud, it’s always fantastic to see the performers on stage, and in this production, I think that they placed them well. Michel Legrand has done a great job with creating a score for this recitative musical, and it was great to see the man conducting his own work himself (it was he who scored the original film production too back in 1964)! I especially liked the refrains from ‘I Will Wait For You’ and how they were laced through the production, with each reprise sounding rather different from the previous. 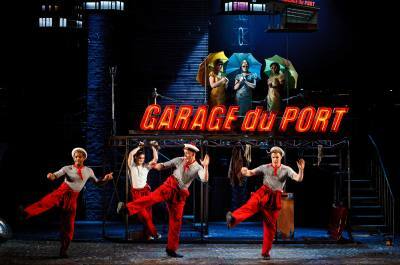 The production successfully embodies what we in the UK would undoubtedly refer to as a ‘French vibe’ and I think that they’ve managed to expose a playful side to France not normally seen on the West End stage (I am thinking of gritty-war-era productions such as Les Mis, and Marguerrite – both from French composers Boublil and Schoenberg). For the ultimate in fun, the little dance number at the start of Act 2 is a must-see. I guarantee you’ll be doing what Karl and I were doing on the way home and chasing each other through the streets of London, doing the funny walk all the way back home hehe. In fact, the only thing that we found to moan about, was that they completely seem to have missed a trick by not including a few choruses of Rihanna’s best-selling hit, Umbrella!! 😉 hehe! No doubt their marketing / PR people will do something along these lines shortly for one of their campaigns (and hopefully I’ll get a royalty if they stumble across the idea here first hehe!!). In summation, this has to be what will definitely be one of the highlights of the West End in 2011 – if you’re contemplating going, then get out your debit card, and get yourself down to the Gielgud theatre for a fantastic night full of gorgeous visuals and delightful harmonies – you’ll be whisked away to the backwaters of France, and you won’t even have to worry about the traveling time, or bringing your passport! (well, unless you’re under 25 and want to buy alcohol in the bar…. ;)). Glad you enjoyed it so much – we did too. Travelled from Wales to Leicester specially to see it! What a shame it didn’t get the audience in London it deserved.